Welcome back to Learn All About Horses. It has been raining in our part of the country. It's wonderful! We have more green grass now than we did the Spring. This horses are loving it. I pray that each of you have such a blessing touch your life. I have learned that appreciating the little things is what makes life worth while. In looking for horse training information to share with you, I found the Kicking Back Ranch website. I believe that you will enjoy the variety of information that can be found at this website. Articles on wild horses and donkeys, draft horses, quick tips on health and training, and just good clean, horse- type fun make this site entertaining as well as informative. Horse handling is full of mistakes. Even the pros make them. Each horse responds a little bit differently from another when first handled. An aid given just a little bit too strongly can cause the horse to "overrespond," (e.g., roll away rather than just slow down). The handler being slightly out of position can cause the horse to "see" a different message than the one intended. So why does the professional clinician look so "perfect?" 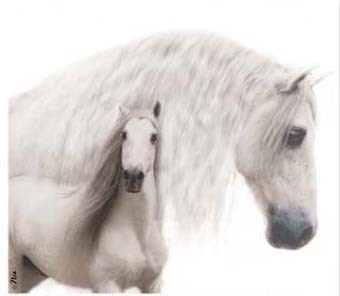 I believe that one of the prettiest, most elegant breed of horses is the Andalusian. The Andalusian has officially been known as the Purebred Spanish Horse and reigned for several centuries throughout the known world as the embodiment of perfection in horseflesh. The Andalusian has a distinguished appearance, usually appearing in the colors white and light gray, and occasionally bay. It is a compact horse with excellent proportions, and usually stands at 15.2 hands. The mane and tail are abundant.